I have been super busy on top of falling down the steps of my motor home and spraining my wrist. It had to be my right one so I missed the last couple of challenges. Enough of that on with the card. I started with a 4 1/4 x 5 1/2 piece of Neenah Solar White 80 lb card stock. I stamped it with the dot background by MFT in Lemon Chiffon ink. 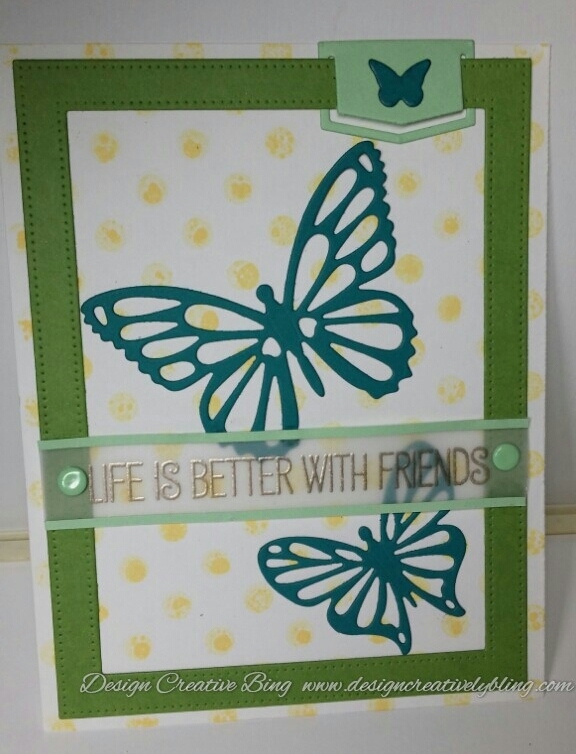 Using the MFT Pierced Rectangle Frame I cut a piece of Gum drop Green card stock. The butterflies were cut using the MFT Flutter Of Butterflies Die-namic in Tropical Teal. The tiny one is from the Hip Clips Die-namic . I used MFT Spearmint and the Hip Clips Die-namic to cut the clip out. I used this same color to cut two thin strip to go on my vellum banner which is embossed using Ranger Liquid Platinum. I assembled my card and attached my vellum banner using two rivets.